Interested in more than 10,000 licenses? Get a quote now. and receive a second year free. pay for measured learning results! There’s no charge for taking quizzes, premium features, or words already known. return on your investment is guaranteed! 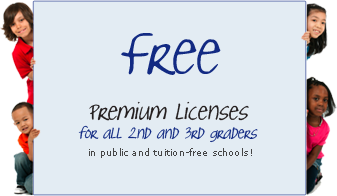 Teacher and student accounts are free. So is unlimited LearnThatWord tutoring. spelling mode, rewards & prizes, and more! A: Every student needs their own account for adaptive tutoring. B: Log in with the account that will administer the account. Organization-wide purchases require an administrator account. completed successfully and the student masters the word reliably. diture is capped at 200 tokens x total number of students. vidual student level. Tokens can be shared and never expire.